I have always been of the opinion that John Young is one of the nicest guys in the music biz and followed his career avidly since meeting him whilst he was on tour with Greenslade many years ago. The John Young band are always a popular attraction and his style is instantly likable so when i heard about his collaboration with bass/Stick supremo Nick Beggs and and Cutting Crew tub thumper Frosty Beedle i was intrigued to say the least. From the very first tasters with the fasinating artwork to the final launch i pinned large hopes on this project and i wasn’t to be disapponted. The album also presented with a strange phenomenen when i eventially sat down to write my review and was listening to it whist doing so. A little more on that later. 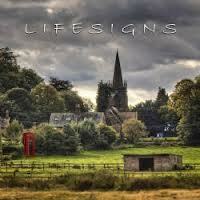 With only five songs and some of Prog’s royalty involved, Lifesigns sets out it’s stall from the outset as being an all out Progressive album and in some ways it is though ultimately i have to confess that it does melt into what would be expected from a John Young album. Lighthouse is a great opener and in the company of two eighties muso’s actually has a somewhat eighties feel. All throughout the album JY’s keyboard textures are soft and seem to put some of the songs into a soft tinted soundstage. However, the song benefits from John’s great voice and excellent keyboard playing with some really nice synth fills. 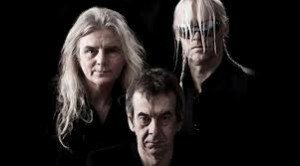 Telephone, which on the day of writing this review was released as a single moves slightly left of Prog and more towards the eighties pop sound in some ways. Nick Beggs sumptuous bass and Chapman Stick has a rather nice growl to it and drives the song beautifully in a way that makes it joyful to listen to though a little lacklustre in grip and overall excitement. This song could well do what all of the efforts that Genesis employed in drawing a female audience into the Prog arena. This continued with the next song Fridge Full Of Stars which is tinged with many Yes traits. Electric and acoustic guitar throughout the album are courtesy of stalwart Jakko Jakszyk and JY band member Robin Boult as well as a camio my the now legendary Steve Hackett. Messrs Jakszyk and Boult contribute admirably preventing the album being a totally keyboard dominated event though often giving the impression of being reined in from time to time. The beautiful vocal harmonies that ring out on the penultimate track At The End Of The World are really quite uplifting with some nice splashes of acoustic guitar backing. John Young’s peaceful vocal beginnings carry the song in a lilting way to a thrashing crecendo aided by some powerful drum exploits by Frosty Beedle who for some reason seemed somewhat muted until i discovered the fore mentioned phenomenen. This is the very bizarre production quality of the album which fails to impress util the volume is turned up a few notches. After i had done so it was as if i was listening to a different album. I am not talking ear splitting levels here, it is very subtle indeed and i would advise anyone listening to the album should you feel it lacks depth. I felt as if Nick Beggs and Frosty Beedle had actually come back into the same room as JY. Carousel finds Steve Hackett’s crazed guitar sound giving a pinch of the old magic to the proceedings as does Thijs Van Leer’s Tull-like flute chops. however, it is the main nucleus of the band that take the album out in style completing the five momorable songs. Songs that do manifest themselves and are likeable too. There are so many good things about Lifesigns and it deserves to sell well. I think it will appeal to a wider audience than just the lentle munching, real ale swilling Prog fan to whom it will be more than acceptable and may even capture the ears of a few ladies. For myself however i would have liked a little more grip and grit and a few less keyboard pads. The booklet artwork is very good and the album comes nicely packaged. Well worth a punt!